The vicuña is a member of the camel family. It is the smallest of the six species of camel, and is thought to be the wild ancestor of the alpaca. It lives on the high, grassland plateaus of the Andes mountains which range from southern Peru to northern Chile and into parts of Bolivia and Argentina. Only tough bunch grasses and festuca grows here. The sun's ultraviolet rays burn through the thin atmosphere during the day. At night the heat of the day escapes into the atmosphere and the temperatures go down to freezing. temperatures. The lower teeth of the vicuña grow constantly, like a rodent's, so they can eat the tough grasses. The vicuña also walks on the soles of its feet so it can flex its toes and grab on to the rocks and gravel-covered slopes. Vicuña milk is very rich so the babies grow quickly. Vicuñas weigh between 75-140 pounds. They are about 4-6 feet long and stand 2-3 1/2 feet at the shoulders. They have very long necks, round heads, and large, forward facing eyes. Their ears are long and pointed and stand up on their heads. Their fur is a rust color, with white around the muzzle,the chest, belly, and the insides of the legs. The white hair on their chests is longer than their other hair. Vicuñas graze mostly on grasses. Their teeth are large and grow constantly like those of a rodent. They chew their cud when resting getting more nutrients out of the nutrient poor grass. Vicuñas are very shy animals and run away fery quickly.They have two territories that they defend from other herds; a feeding territory or about 45 acres, and a smaller sleeping area on higher ground where they are more protected. The vicuña live in herds of 5-10 members, which includes one dominant male and several females and their young. They mate in March and April and their young are born 11 months later. The young stay with their mother and the herd for another 10 months, when they are driven off by the herd. Young males will form bachelor groups and the young females try to find another group to join. This ensures that the herd stays the same size, which is important with their limited food supply. The vicuña was almost hunted to extinction for its beautiful soft wool. The Incas used to round up the wild vicuñas and pen them in stone corrals, where they were sheared for their wool. In modern times they were almost wiped out for their meat and wool. By 1960 there were only 6,000 vicuñas left in the wild. Chile and Peru established protected national parks and put a halt to trade in vicuña wool. Now there are about 125,000 vicuñas, but they are still listed as threatened. 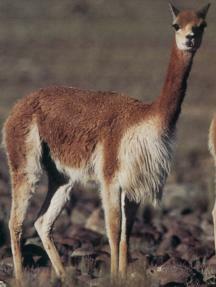 The vicuña is classified as vulnerable by the IUCN, and as endangered by the USDI. "Vicuña", Wildlife Explorer, International Masters Publishers AB, USA.